As mentioned earlier I’m way behind on my swatching schedule. 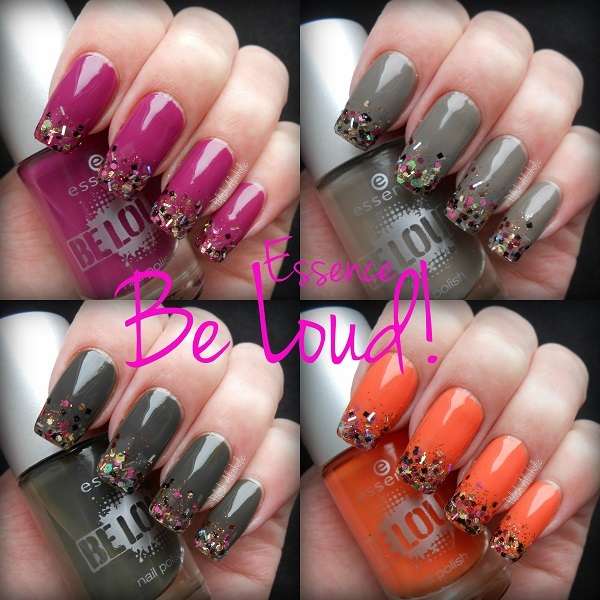 This collection, Be Loud!, by Essense is released a while back so I’m not sure of you can still get your hands on it. I’d like to show you the five polishes anyway because they deserve a place here. The formula of the four creams is perfection. They all need two easy coats for full opacity without streaking. If you’re careful you can get away with one coat. Thumbs up for that, Essense! First of all, a mega glitter bomb: Not Punky For Funky. There is a lot going on in this polish. 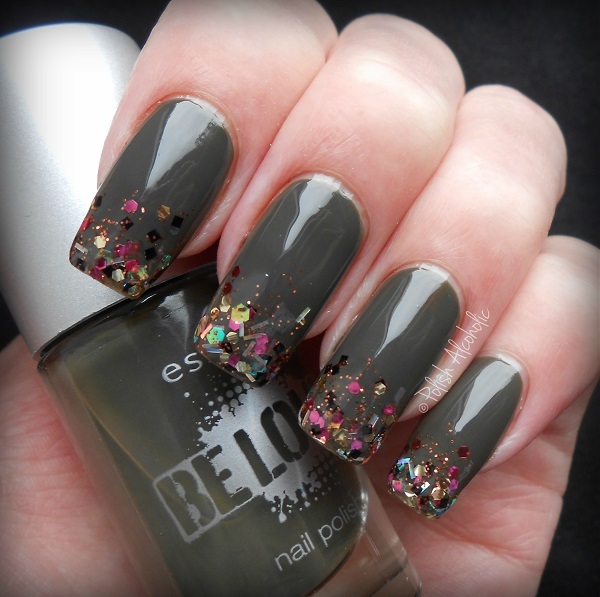 Let me see… holo bar glitter, gold and pink hex glitter, black square glitter and fine copper glitter. It’s very dense but fine to work with. 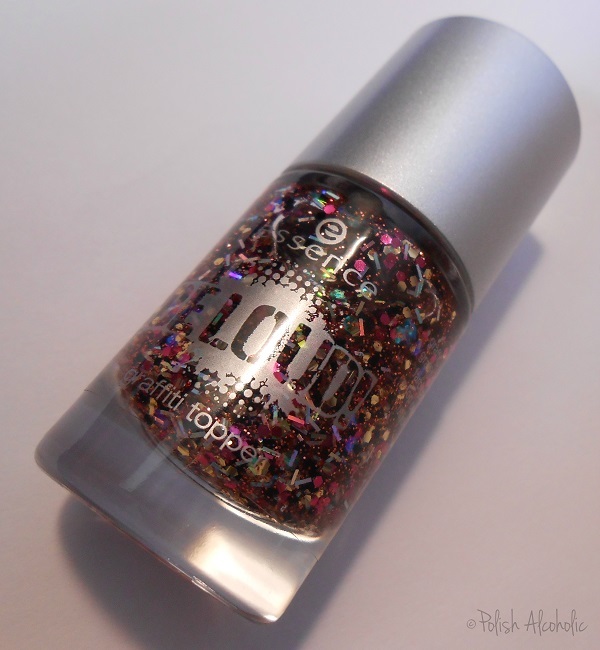 I chose to use this glitter topper to create a gradient effect on the swatches of the creams. All swatches have a base coat, two coats of color, Not Punky For Funky on the tips of my nails and a top coat (Seche Vite). Like A Stone In The Wall, an army green cream. Riot Grrr-eeen, the darker sister of Like A Stone In The Wall. Orange is the New Black, an orange cream. The only complain I have about this is the name. Not so original… Riot, a purple cream with fuchsia undertones. What do you think of these? 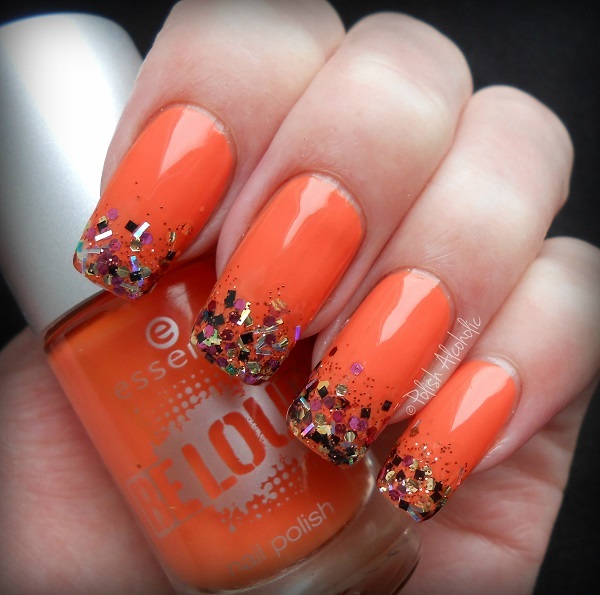 This entry was posted in Essence and tagged essence, essence be loud, essence like a stone in the wall, essence not punky for funky, essence orange is the new black, essence riot, essence riot grrr-eeen, nagellak, swatches by Polish Alcoholic. Bookmark the permalink. Riot is super pretty ! Oh wow, this glittery gradient is GORGEOUS. Ah, thanks for your reply (and believing in me, lol). Seems I’m using a wrong kind of glitter polish, it’s really “dense” with lots of smaller particles and it just doesn’t work well for a gradient-like finish. Wauw those glitters really make the swatches beautiful! Oh! I love the glittery tips on your swatches! 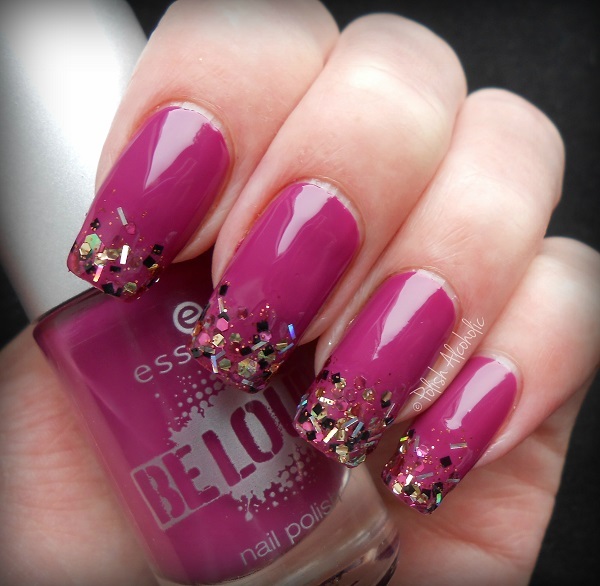 Lovely colors, and the glitter makes the swatches so more interesting! drool! I love your glittery tips.